are the convenient, simple solution to fire building, no kindling required. Caveman Fire Starters are made of premium quality 100% Recycled Hardwood chips and just enough pure parafin wax as a binder. Place 1 Caveman Fire Starter approximately 2 inches under carefully stacked wood. Light the wick and watch. Creates a 5 to 6 inch flame that lasts approximately 20-30 minutes. 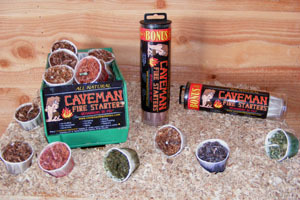 CAVEMAN FIRE STARTERS...they're really "catching on!"